Contact us today to find out what we can do for your home! Are you considering installing a new copper roof on your home or place of business. Copper roofs are becoming increasingly popular due to their long lifespan, low-maintenance and choice in styles, including standing seam, flat seam, diamond panels and copper shingles. You can also choose the type of finish you’d like on your new copper roof as well as whether or not to allow your copper roof to develop a patina, which is the green-gray hue that develops on the copper over the course of six to 20 years or to keep your copper roof looking new by applying special coatings and sealants. 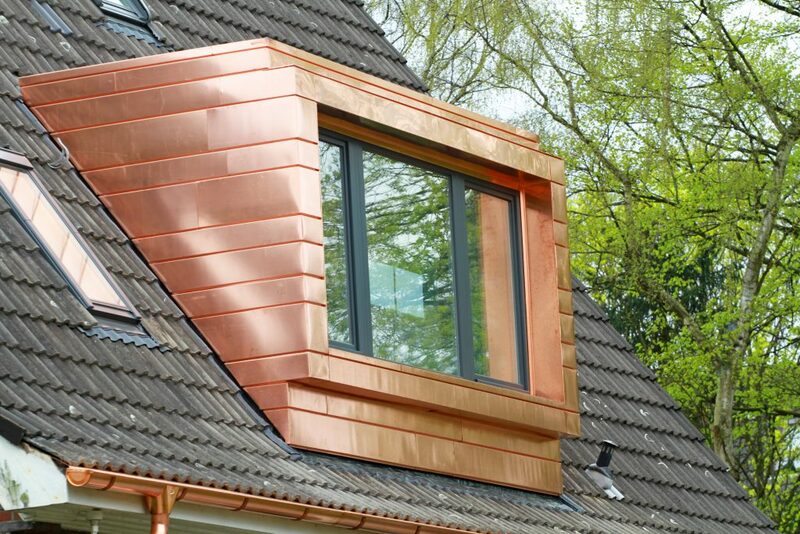 Copper roofs can be given a wide range of finishes, depending on the composition of the copper and the chemicals placed on the copper after installation. For example, 99 percent copper is salmon red upon installation. Other metals can be introduced to create alloys such as 90 percent copper / 10 percent zinc (red-gold upon installation), and 85 percent copper / 15 percent zinc (reddish yellow in appearance upon installation). All of these copper and copper alloy roofs form patinas over time, ranging in color from gray-green to gray-brown. The reason is oxidation, and homeowners and commercial building owners can opt to allow the patina to form, or use coatings to stop the patina process. Copper roofs last more than 100 years due to oxidation and the patina that forms on the surface of the copper. The patina process starts the minute the copper is exposed to air and moisture, and over time, a very thin layer of corrosion develops on the copper, which helps protect it against the elements and degradation. As more years pass, the patina thickens, changing the appearance of the copper from a shiny bronze color to gray-green or brilliant green, like the shade of green on the Statue of Liberty. Two factors can slow the formation of the patina, including how clean the copper is when it is installed and the amount of moisture present in the environment. If the copper panels are lubricated or oiled by the manufacturer, this can slow down the development of the patina because the oil or lubricant acts like a coating that prevents air and water from coming into contact with the copper. If the environment is extremely dry, like in the desert, it may take as long as 20 years for a patina to start to develop. However, a copper roof that is installed in an ocean environment may develop a patina in as little as five or six years. While the formation of the patina should be considered a natural process and admired, some homeowners and commercial building owners may want to keep the original color of the copper by preventing air and moisture from coming into contact with the copper. This can be accomplished by coating the copper sheets, panels or shingles with a sealant that prevents air and water from coming into direct contact with the copper. Common types of copper sealants include nitrocellulose, acrylic and silicone. Nitrocellulose coatings are the most popular due to their cost, but they must be reapplied every year. Acrylic coatings are slightly more durable, but also more expensive. Silicone coatings also work well to prevent patinas from forming on copper roofs. This is slightly more expensive than nitrocellulose but may offer the best protection against the formation of the patina. Once the coating is applied, the patina process will not occur as long as the coating remains intact. Unfortunately, coatings do wear away over time, which means the copper roof will need to be resealed periodically in order to maintain its shiny, original color, and if the coating wears away unevenly, parts of the copper roof may start to develop a patina before other sections of the roof. The good news is that home and business owners can stop coating their copper roofs at any point and let the patina develop naturally. Any coatings placed on a copper roof are merely for aesthetics. They don’t actually protect the roof against wear and tear. The copper is wear, tear and weather-resistant all by itself. If the patina has already formed on the copper roof, it can be removed in order to restore the original color of the copper. The process starts by thoroughly cleaning the patina from the copper. This can usually be accomplished via powerwashing, but may require some scrubbing by hand if the patina is particularly thick. Once the patina has been completely removed, the copper can then be sealed in order to prevent future redevelopment of the patina.